Worldbox Business Intelligence has expanded its Hong Kong bureau to serve as a hub for Asia-Pac co-ordination, as well as offering corporate solution services as an extension of its company information product line. The Swiss-based firm, specializing in international cross-border business information, has expanded its Hong Kong office to become the regional headquarters for the Asia Pacific region. Hong Kong’s protective intellectual property legislation and free flow of information also contributed to the firm’s decision to set up there. For nearly two decades, Hong Kong has been ranked as the ‘World’s Freest Economy’ by the Wall Street Journal and Heritage Foundation, acting as a magnet to thousands of domestic and international businesses who have been flocking there to serve the Asian continent as a whole. Last year, Hong Kong’s Companies Register recorded a total of 12,188 public companies and 1,167,043 private companies there: numbers which continue to grow, year-on-year. There is also a booming Small-to-Medium Enterprise sector on the island, with 314,000 recorded as operational there in 2013. 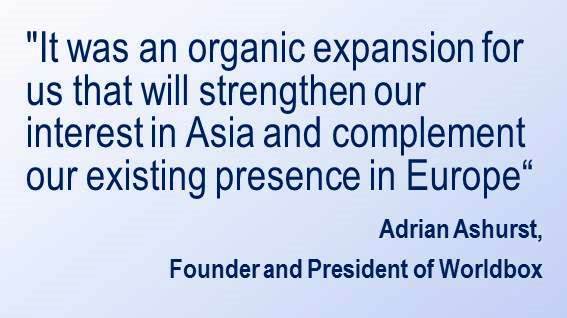 Worldbox’s Hong Kong operations will be able to cater to both international corporations arriving in Asia to capitalise on growing consumerism or Asian SMEs looking to partner with Western businesses who wish to bring their products to the domestic marketplace. The Business Intelligence experts Worldbox aim to be the regional leader in providing up-to-date, reliable and independently-vetted business information to enable buyers, sellers, partners and takeover targets to make profitable decisions.